How fast can a retiree's stock portfolio fall once the market heads south? As Bob Seger sings in those Chevy truck commercials, "Like a rock." The financial industry believes that the best way to manage your money after you retire is to invest in in a portfolio of stocks and bonds and withdraw 4.5% of the initial portfolio amount every year. They say you'll have a 94% probability of your money lasting at least 30 years. They say that if you start out with a million dollars, you can pay for those thirty years of retirement and have a 50% probability of leaving more than $800,000 to your heirs (or $80,000, for example, if you start out with $100,000 and withdraw 4.5%). May that bring you much comfort if you fall into the 6% that spends all of their savings before they die. Here's the worst historical case for a 60% stock portfolio, the thirty-year period from 1968 to 1993. Your savings would have lasted about 25 years. If you earned average market returns. Which no one does. Things would probably have looked pretty good to you for the first 19 years, drifting back and forth between 80% and 100% of your initial portfolio value. Then things headed to hell in the proverbial hand basket. You would probably have stuck with the strategy for another three or four years before panicking and aborting. Unfortunately, you were pretty much screwed at that point. Here's a look at the five worst cases. The legend shows the years that the 30-year periods began. It's interesting how most of them look just fine for about 19 years and then fall "like a rock". The exception is the period that began in 1936 (shown in red) and lost 20% of its value in the first year. It was all downhill from there. Does this feel like something you could see coming at age 85 and quickly change your strategy? Did you see the 2007 to 2009 market crash coming and get out in time? If you decide to go this route with your retirement finances, it might be good to keep this song in your head. What percentage is in stocks for these worst cases? Also, unless you barely have enough to live on, most retirees I know adjust their spending depending on the market conditions. If you cannot do that, you should not have very much in stocks to begin with. Retirees should, of course, adjust spending to market conditions, but that isn't what the Safe Withdrawal Rate studies do. They assume the retiree continues to spend the same amount even in the face of near-certain ruin, which is, of course, absurd. 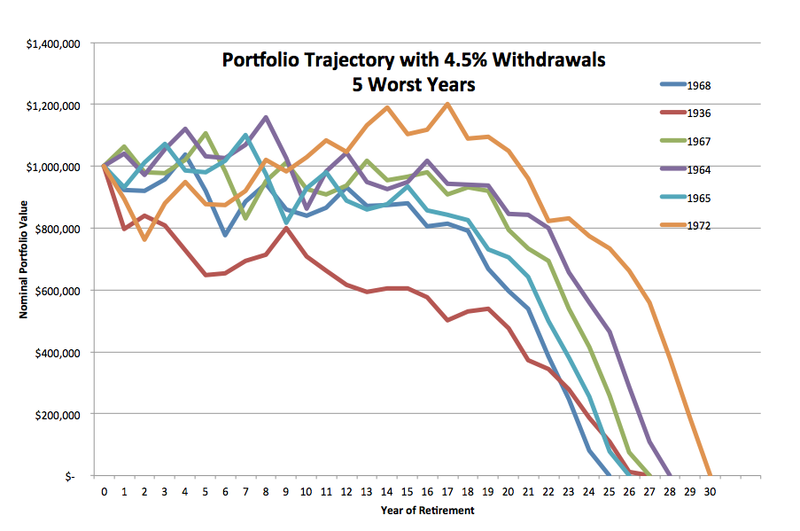 In reality, the retirees in these scenarios wouldn't go bankrupt as the SWR models predict. They'd bail out and end up with much less income than those models forecast. 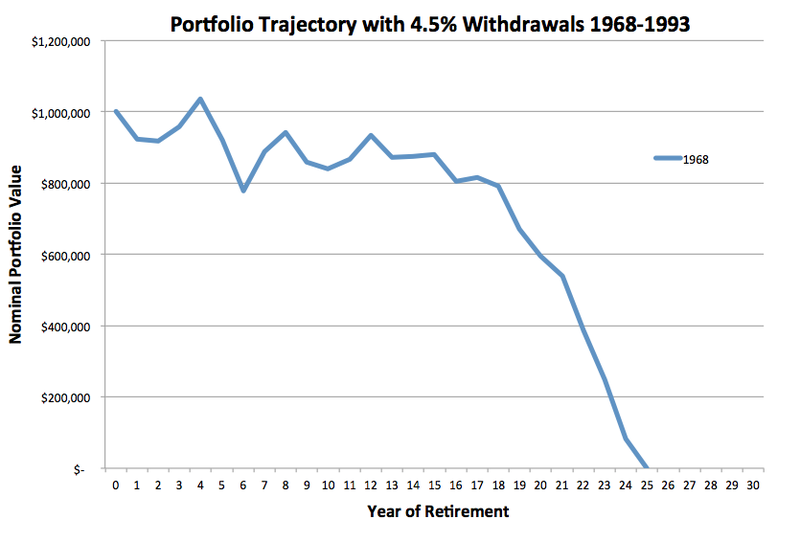 My point is that the end of a retirement portfolio can come very quickly. And I could not agree more with your last sentence. Thanks!